Of all the things to do and see at the Bucket Regatta, the most important occasion is the Awards Ceremony, which was held in great style Sunday evening, across the harbor at the Hotel de la Collectivité, with hundreds of Bucketeers attending. 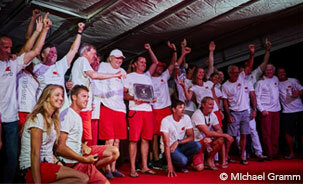 The grand outdoor stage hosted third- through first-place teams in five pursuit classes and a sixth for J-Class yachts, with Unfurled taking the stage twice, once to receive a Chelsea Clock Award for its victory in Les Gazelles des Mers and a second time to hold high the Bucket Trophy for best overall performance. Seahawk also took the stage twice for finishing third in Grandes Dames and winning the All-Star Crew Award, a plastic bucket filled with goodies that one crew member said he wouldn’t trade for all the tea in China. Other winners of special trophies were Rebecca (Wolter Huisman Memorial Spirit of the Bucket Trophy); Alexa of London (Vitters Seamanship Trophy); and P2 (Perini Navi Cup). As it loves to do each year, the Bucket Regatta loves to give back to the famously French and friendly island of Saint-Barthélemy that is its gracious host. 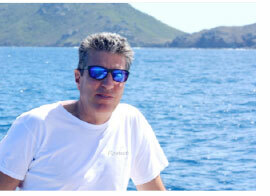 This year, a check for 20,000 euros was awarded to the St. Barths Yacht Club to underwrite the purchase of replacement boats for the children's fleet. Among the official charities helped in previous years are the Special Needs Children Project, St. Joseph’s School, Sisters of St. Paul of Chartres House in Lorient, and Foundation for Emergency Medical Equipment. 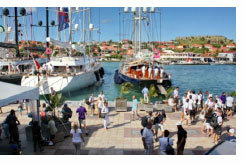 Media Pro International’s Barby MacGowan is reporting daily from St. Barths. Read her recaps here and her Bucket Blog. With the surge still strong in Gustavia Harbor, there were fewer yachts than usual on which to hop Saturday night, but Bucketeers in their casually cool clothing (to match the casually cool night) still enjoyed cocktails aboard Zenji, Rosehearty, Meteor, Seahawk and the Gatsby-themed Perseus^3 where the crew, decked out in appropriate period attire, and the popular sax player from Nikki Beach kept things properly flapping on the upper-deck dance floor. 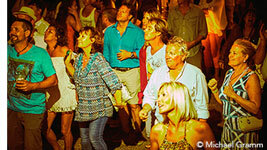 For the first time, the Bucket Bash was scheduled for the same night, so when the yachts shut down at ninish, there was more fun on tap across the harbor at the Hotel de la Collectivite, where live music by Soley, a popular local band, cranked until midnight. 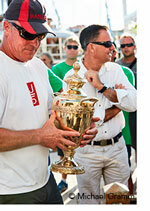 A bucket is a sailor’s best friend, especially when it’s THE Bucket won as the overall trophy here. But there’s another bucket that is perhaps as coveted: the “fun” bucket full of favors that is the All-star Crew Award presented by Rybovich. Here’s how it works: each year, every yacht casts a ballot for the single crew among the fleet that best demonstrates the pinnacle of the professsion and has the most fun doing its job. Because it is earned by peer recognition, this bucket carries some serious weight within the marine industry. And speaking of buckets, Hermès, which hosted a glamorous party at the Taiwana restaurant for owners and their friends on Friday night, has flown in an artisan from Paris to hand craft a first-ever take-home prize for the overall winner of the Bucket Trophy, which is a perpetual. The keeper is an engraved Puiforcot champagne bucket that can travel in a leather bag stiched with the name of the winning yacht. Other special trophies are the Wolter Huisman Memorial Spirit of the Bucket Trophy; the Vitters Seamanship Trophy; and the Perini Navi Cup. Class winners each receive a ship’s bell clock by Chelsea Clock, “America’s authentic Nautical timepiece” with hand-silvered dial, 364 precision brass parts (many plated with gold), and 11-jewel movements, all made in Chelsea, Massachusetts, since 1900. The Bucket logo has a pineapple in it for a good reason. It’s a symbol of hospitality and that’s what the team at Bucket Headquarters specializes in. 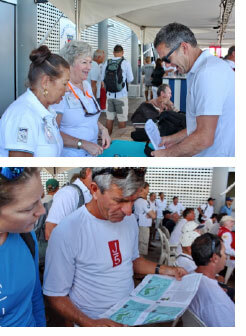 Oh, and of course they’re keen organizers and know how to run a regatta like nobody’s business. Hundreds of sailors checked in for Friday’s first day of pursuit class racing, which started with a skippers’ briefing that further swarmed the docks with activity. There’s plenty of talent here, including America’s Cup and Volvo Ocean Race veterans as well as world champions and national titlists from many, many nations. And not just all men – plenty of women, too. 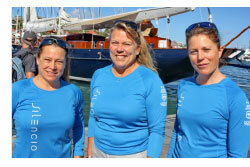 Six crew members aboard Silencio are women. The brains in the back of the boat are navigator Suzy Leech (a two-time World Champion), tactician Dawn Riley (America’s Cup and Whitbread veteran), and helmswoman Sam Davies (skipper of the all-women’s team in the last Volvo Ocean Race). Darn the large swells that have kept many of the Bucket yachts from berthing Med-style at the Capitainerie while not racing. Nevertheless, the half dozen or so lurching at the dock – with their towering rigs, polished steel, and shining mahogany – are an eyeful for anyone walking by. So far, none of the crews has complained about taking launches to the outer harbor to catch their superyacht rides every morning; it’s all well-orchestrated plus it’s not bad scenery to take in. And besides, for those boarding at the dock, sometimes daring leaps to the passerelle must be made. The notable trade out, however, is the short commute to the Bucket Bar after racing each afternoon. 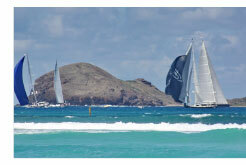 Yesterday’s Around the Island race was designed to give everyone on the island of St. Barths a chance to see in action the yachts they are used to viewing at rest on the docks. From the La Plage restaurant in St. Jean, watching the pageantry of sail just offshore, beyond the beach break, paired exquisitely with a salad nicoise, a dip in the ocean and a glass (or perhaps two?) of rosé. The Owner’s Party at Eden Rock was a red-carpet affair, with plenty of delectable foods – including sushi and gourmet pizza – and a fireworks display that wowed the guests and most likely surprised (pleasantly) anyone enjoying dinner at a nearby beachside restaurant. As its name implies, the Owner’s Party celebrates those who truly make possible this unique experience of sailing magnificent superyachts in the equally magnificent setting of St. Barths. There has been plenty of preparation on the docks and on the water over the past few days, but sometimes you have to take a break, and the crew of Perseus^3 decided there was no better day than St. Patrick’s Day (Thursday) to stay ashore for some Beach Olympics. It made sense, considering the owner and nearly half the crew are Irish and Perseus^3 flies the burgee of the Royal Cork Yacht Club, the oldest yacht club in the world. Said Perseus^3’s Niall Rafferty: “We prepped the boat this morning, and now it’s beach time this afternoon with the boss and his family to do a bit of team bonding.” The Games included a hilarious “pass the drink without spilling” contest and a seriously funny tug-of-war. All props and costumes were arranged by the Perseus^3 crew well in advance of coming. Rafferty promised that absolutely no iguanas were hurt in the making of the Perseus^3 crew’s frolicking fun. At the SuperYacht Racing Association’s Annual General Meeting, now traditionally scheduled to coincide with the Bucket each year, movers and shakers in the superyacht world participated in the discussions and updates. But first things first…Executive Committee Co-Chair Kate Branagh awarded SYRA’s annual recognition trophy to Captain Jonathan Kline (a member of the SYRA Executive Committee and the Communications Officer on P2, which is competing here). 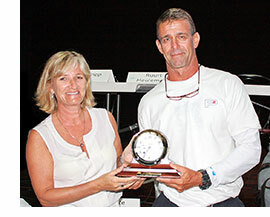 He was presented with a beautiful, handcrafted Ship’s Bell Clock from Chelsea Clock for his many contributions to the advancement of safe racing. “Because of him, we are in a far better place than we were 18 months ago,” said Executive Director Peter Craig. Click here for the 2015 St Barts Bucket Blog.